Vaughn Velocity V6 2200 Pro Goal Pant | Sports Etc. • Lighter weight with the use of composites. • Outer belt and front lace allows for more adjustment and precision fit. • Available in sizes S, M, L, XL. Note: This pant will fit about 4 inches smaller around the waist than a typical goal pant. The 2200 pant is designed with a narrower upper waist section that fits closer to the body. The kidney and upper sections of the pant is designed with special Ultra-high density foam segments that are specifically designed to give complete flexibility to the body core. 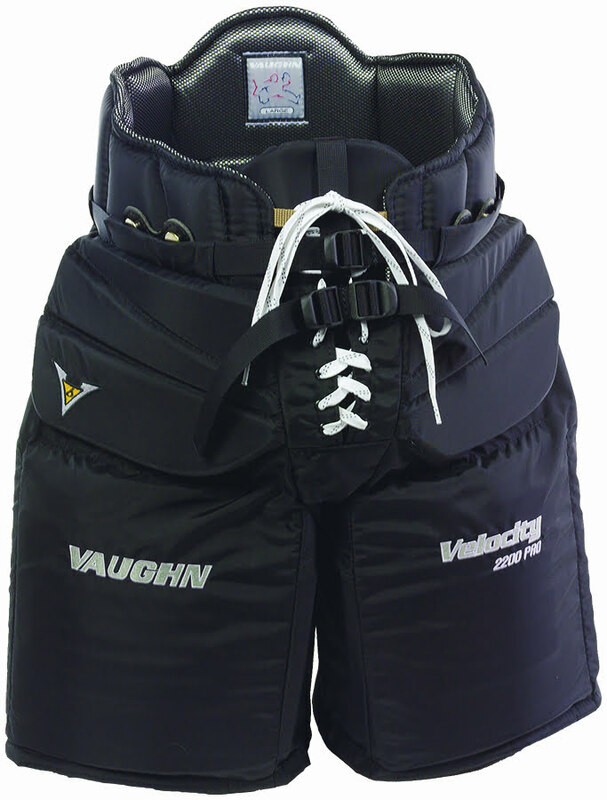 The interior of the pant also features a padded belt with dual front adjustment buckles so the pant can be tightened for a precise fit to the individual goaltender. Large Carbon fiber thigh guards reduce weight and increase protection and give a more solid blocking area on the thigh guard edges. Sports Etc Performance To Value Rating– 9 out of 10. The reinforced carbon fiber throughout the pant makes it extremely lightweight and protective. One of the very best on the market.